When the first of the popular digital formats, the now ubiquitous CD, entered the market, we were led to believe that we would now have "perfect sound forever," and that wed be able to do away with all the apparatus wed collected over the years to clean and maintain our beloved LPs. Well, it was nice in theory, but in the ensuing 22 years, and despite the introduction of many more digital formats, weve never found that "perfect sound" we were promised. Regardless of how hard the audio designers and engineers tried, it didnt quite happen. In fact, some folks returned to their vinyl collections to escape the shortcomings of the digital formats. In the years since, weve learned that some of the reasons for the performance shortfall of digital media rest within the actual CD or SACD or DVD itself, whether it be poor quality control in the manufacturing of the disc, poor digital remastering of analog originals, or other reasons. Such problems quickly spawned a growing subindustry of "digital format tweaks." One doesnt have to look too far to find CD pens, CD mats, myriad lotions and potions, and now the so-called "smart cards," all of which purport to bring the listener ever closer to that elusive goal of "perfect sound." One of the main explanations for the performance shortfalls of the digital formats is errant light bouncing around inside the disc and thereby impeding, however slightly, the ability of the players laser beam to track the tiny pits engraved in the discs surface. 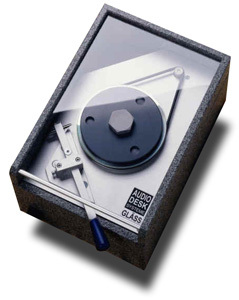 Numerous ways to solve this problem have been devised, but the subject of this review doesnt require the application of indelible inks or solutions to your CDs, nor does it require you to gingerly insert a sandwich of a CD and some vegetable-treated or metallic-coated or specially balanced mat into your much-valued player. It does require you to carve up your discs at high speeds -- on a lathe. Welcome to the machine . . .
That lathe, the CD Sound Improver ($699 USD), is made by Reiner Glässs company, Audiodesksysteme Gläss, in Königsbronn, in the state of Baden-Württemberg, Germany. The lathe is Glässs adaptation and implementation of the results of considerable research that has gone into the issue of scattered light in digital media. In a series of tests, Dr. Erich Schrott and engineer Wolfgang Schneider determined that beveling the edge of a disk at 36 degrees could dramatically reduce scattered light and thereby audibly improve the sound. The Sound Improver arrives assembled and ready to go, its cutting blade already in place to make the prescribed bevel -- depth, angle, blade pitch, etc. Also included are easy-to-understand instructions, a detachable IEC power cord, a black felt pen for blackening the edges of the disc, a small brush to remove the shavings of polycarbonate, and an extra drive belt for the lathe. Most important was the inclusion of a blank CD to practice on -- carving up the blank gave me the feel for how to do the deed to my own CDs. The blanks freshly beveled edge can also serve as a template for positioning the blade, should you need to replace it. The Sound Improver itself is built well beyond the needs of the work it does. Its construction is, in a word, robust -- I expect it will outlive me by many years. The lathe motors specs werent included, but its a heavy little brute whose speed can be controlled by a dimmer-style switch on the front. The motor spindle is connected via a rubber belt to a rubber-surfaced flywheel, on which the disc to be machined sits face up (i.e., label side down). The flywheel is only about 0.5" smaller in diameter than the disc it holds, and is clamped into place by a rubber-surfaced disc of similar size via a large, hand-tightened bolt. The arm that holds the hardened-steel cutting bit looks like something my dentist would use. Its a well-conceived and -constructed swing arm with just enough play to let the user properly bevel a discs edge without damaging the disc. Everything is enclosed in a wood-based case thats covered with a glass safety door, hinged at the back. Operating the Sound Improver is very easy -- the motor is more than powerful enough, and the cutting bit and arm are wonderfully overbuilt for the job. Each disc took no more than 30 seconds to bevel, but I was amazed to discover just how physically inconsistent CDs actually are. Some seemed larger than others, while all were irregularly shaped, either "off round" or with a rough edge. It would seem that, apart from reducing scattered light within the CD, the process of beveling its edge also serves to make the CD considerably better balanced, which may also improve the performance of ones system. A word on using the felt pen to darken the edges of a newly beveled CD: Spin the disc in the lathe exactly as explained in the instructions. Darkening the edges of a beveled CD by hand is a slow, tedious, imprecise process, so do it on the lathe. To determine if the changes wrought by the CD Sound Improver were perceptible, I enlisted the help of a friend whose tastes in music are similar to mine. We started off with a few Red Book CDs of which we both owned copies, and made sure that each copy had received the same tweaking prior to introducing the lathe. I then lathed my copies of the CDs. The changes resulting from the beveling process were more about what was removed from the recording, with the result that I seemed to hear more of the music. With all five CDs, and many others that I subsequently treated with the Sound Improver, there was a distinct lessening of digital glare and the concomitant "etchiness" many of us hear, in varying amounts, from digital recordings. The bass lines on all tracks of Cassandra Wilsons New Moon Daughter [Blue Note 8 32861 2], which hitherto had sounded rather muddy, came through with much greater definition. I could now actually follow what was being played. Moreover, the recording now had a more relaxed feel that made an already great album all the more enjoyable. Similarly, when listening to Alanis Morissettes Jagged Little Pill [Maverick 45901-2], all the instruments seemed to come from a much quieter, darker background than with the untreated version. It was as if I could hear and feel real instruments. Most important, I could hear Morissette as never before -- she really has quite a remarkable voice, very capable of conveying all her moods and emotions. It was great to hear it reproduced so palpably. My favorite vocalist these days is the late Eva Cassidy, and her Live at Blues Alley [Blix Street 10046] has been receiving a lot of airtime around the house. Once Id beveled the CDs edge, I found her voice to be more delineated and palpable against the ambience of the Blues Alley venue. Her acoustic guitar actually sounded like a hollow wooden body resonating with every pluck of a string -- it sounded real. At the beginning of "Autumn Leaves," a bit of feedback through her microphone adds to the magical sense of being there. The lathed disc was much better at revealing this magic throughout the album. No longer did I have the sense of listening in on the proceedings -- I was there with all the other patrons of the club, reveling in Cassidys brilliance. The Audiodesksysteme Gläss CD Sound Improver worked very well with all of the CDs I treated with it, and with some, the improvement was startling. Regardless of the degree or nature of the improvement wrought in any single recording, there was a consistent and substantial reduction of digital glare. The net result was more music. Some may think $699 a lot of money to spend on a tweak, compared to many other CD treatments currently available. However, I anticipate that the CD Sound Improver will serve its owner many years, and make its cost per disc virtually negligible.